Prime Minister Moses Nagamootoo, with his wife Sita, in the U.S.
Prime Minister Moses Nagamootoo is expected to undergo heart bypass surgery today at a medical institution in the United States (US) and will not attend a crucial National Executive Committee meeting of the Alliance For Change (AFC) to plan for the Cummingsburg Accord review. Kaieteur News understands that the Prime Minister departed Guyana on Saturday, February 3rd for the U.S. According to Minister of State, Joseph Harmon, the Prime Minister was advised by local doctors to seek further intervention following a routine medical examination in Guyana which revealed that he has ‘some cardiac issues’. Harmon stated that due to the recommendation from the local medial team, Nagamootoo brought forward a planned, private visit to the US. Nagamootoo, according to Harmon, is expected to recover fully in the coming weeks. 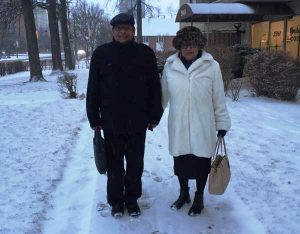 He is accompanied by his wife, Mrs. Sita Nagamootoo. Details about the medial facility are being kept private at this time. Vice President and Minister of Foreign Affairs, Carl Greenidge will continue to perform the duties of Prime Minister. Nagamootoo is described as the ‘elder statesman’ of the AFC. He assisted in crafting the Cummingsburg Accord which was signed on February 14, 2015 between the AFC and A Partnership for National Unity (APNU) that catapulted the coalition into Government. AFC sources have confirmed that Nagamootoo is not gravely ill and has been in good spirits while communicating with the party’s leadership. No date has been set for the Cummingsburg review between the AFC and APNU. In Nagamootoo’s absence, the AFC executives will go ahead with their meeting on Saturday, February 17. Last Sunday, AFC Leader Raphael Trotman told Kaieteur News that the party is encouraged by President David Granger’s words that ‘we are better together’.